The Klamath Basin was once the third most productive salmon river system in the U.S. 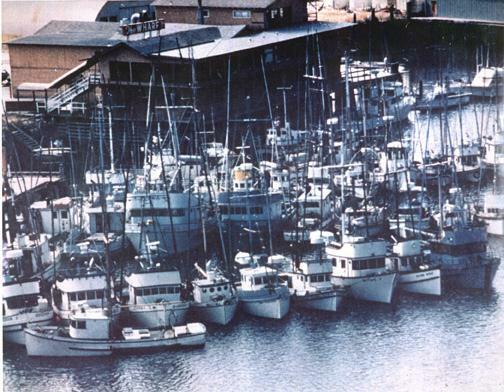 The photo above was taken of the commerical fishing boat landing at Fort Bragg, CA just before the start of salmon fishing season in April 1980. 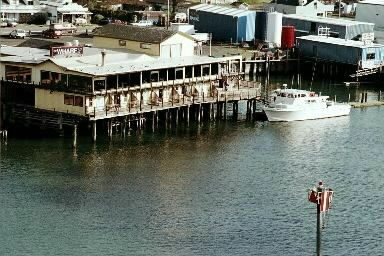 Once a booming salmon port, Fort Bragg is now one of many coastal salmon ports along 200 miles of coastline now all but closed to protect weakened Klamath Basin chinook and coho salmon. Commercial fishing boat land for Fort Bragg, CA during the same place and time of year, but in 2002. This and many other once-productive salmon ports from Fort Bragg, CA to Coos Bay, OR are now virtually closed to salmon fishing because of too little water coming down the Klamath River to support harvestable runs. Coho salmon in the Basin are now so depressed they are federally protected under the Endangered Species Act.